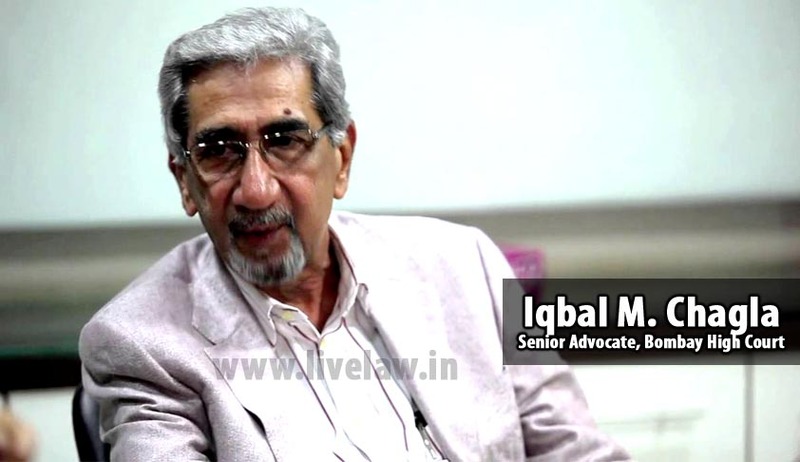 Mr. Iqbal M. Chagla is one of the most sought-after counsels in civil litigation and company matters and the successor to the very illustrious Lt. Justice M. C. Chagla. Recently, he completed 50 years at the Bombay Bar and has appeared in many high-profile cases as one of the most distinguished Senior Advocate of the Bombay High Court. He represented Mr. Cyril Shroff against Mr. Shardul S. Shroff, who was represented by Mr. P. Chidambaram in the well-known Amarchand Mangaldas dispute. In this conversation, he talks about his career, the life at Cambridge, experience of working under Lt. Nani Palkhivala and so on. Live Law: Being the son of a commendable diplomat, a renowned jurist, a cabinet minister, the first Chief Justice of the Bombay High Court, an astounding professor of constitutional law at Govt. Law College, Bombay and a man who has adorned every role he had to play with loads of excellence, how did Lt. Justice M. C. Chagla mould your infancy and your career choice? Mr. Chagla: My relationship with him was extremely close particularly since we had much in common from the point of view of literature, the Arts which he inculcated and encouraged. I was unabashedly, totally his greatest fan and looked up to him. As far as my career was concerned, I really wasn`t going to be a lawyer. I was more interested in writing. I thought of journalism. In fact after Cambridge, I was being called at the Bar in London. I was thinking of going to the Sorbonne in France. But then, unfortunately, my mother died and I had to rush back to India and then, I came back to India and I became a lawyer. And just there, then I`ll tell you the main reason which was that I could never imagine being in a job 9-5 and serving somebody right through, that was something totally alien to my nature! So the best alternative was to become a lawyer and be a free person. Live Law: Do you regret that you did not go for journalism and opted for law as a career? Mr. Chagla: Maybe in the beginning maybe, I did sort of feel the lack of it. But one thing I must tell you that this profession becomes so demanding that you end up reading law reports rather, I used to be a very avid reader but I find that now I read less because there`s less time to read. Reading more law books than otherwise. And now, after 50 years I’m reverting back to what I was earlier. I am trying to read more of literature, biographies and things like that. Live Law: Sir, you have studied at the prestigious University of Cambridge at a time when literally a few could have thought of studying abroad. How was life at Cambridge? Mr. Chagla: Well you are right about thinking of studying abroad. My father always told me that I am not going to leave you any large inheritance, all I am going to leave you is an education which is the finest education and one cannot thank him sufficiently for that. He educated two sons at Cambridge and that really was the greatest inheritance! And how was life at Cambridge? Oh unbelievable! Unfortunately maybe I was little too young when I went there. I went when I was 18 years old. I went there from St. Xavier`s College where, for every lecture we were marked for attendance- present, not-present. From that environment, I go to Cambridge. I was at King`s College and was doing History Part-I and there were a bunch of lectures. And so I went to my tutor so I asked him, “What am I supposed to do?” He said, “Very difficult question! I can only give you my own experience. I had the same dilemma so I went to my senior tutor and I asked him and he said, “What has your tutor told you?” To this, my tutor replied, “Well, he told me three a week would be enough.” Then, the senior tutor said, “Well, he is your tutor, I wouldn’t like to interfere but speaking for myself, I still believe one is more than enough, one a week!” So my tutor said, “Now look, let me tell you. In the first two weeks, attend as many lectures as you can then, decide which are the lectures you like. Go to those and forget the others!” I just couldn’t believe that this was the new environment in Cambridge, so that was one part of it. The rest was, I think three years at Cambridge is just about the danger line. Those are the three magical years where you begin to believe that you are going to rule the destinies of the world. You will do this and that and the other. Sit over coffee after dinner in each other`s rooms and all this. The three years beyond that you would perhaps, actually believe that you were something extraordinary. They were wonderful years- the people that I`ve met, the professors, the lecturers and all that. Live Law: You have a high degree of reverence for Lt. Nani Palkhivala, whom you have also assisted as a junior in your initial years. Could you share a couple of anecdotes about your experience with our readers? Mr. Chagla: In my book, I think Nani Palkhivala was perhaps one of the greatest minds that I have encountered. His knowledge of the law, of literature and his amazing memory. And I have mentioned this before, that in a matter where I appeared, I was briefed with him. I was his junior at that time. The matter was an appeal and it was the Kariba Ibrahim Trust where it was to be argued on Trust principles because it was a matter of Trust Law and where the Kariba Ibrahim Trust acted in appeal so the question was whether it will be a resulting Trust, if a resulting Trust then will it be the Hindu Law of succession, Mohammedan Law of Succession and all of these were the sorts of questions that arose. And Nani was the most polite and the most courteous person. There was this very senior man and then there was this youngster who just joined the Bar and didn’t know what the hell was happening. He said, “Iqbal, Can we meet tomorrow evening? Will that be convenient? What time will be convenient?” I said, “Nani, what is convenient to you? Because I`ve nothing to do.” So he said, “8 O` clock, is that alright?” I said, “Absolutely! Whatever time you say.” So, at 8 O` clock, I went to his chambers with armful of books. Those were the days when we didn’t have Xerox copies so you had to actually carry the books and they were all on Trust Law, some seven or eight books that I looked up and we talked for a few minutes and he said, “Give me the books.” Then, one after another, he would read that and he`ll be like, “No, we don`t need this.” And he held a piece of paper and the next one he read through was very good and he noted down 1848 Queen`s Bench, Page 145 on that piece of paper. So that way he went to the whole lot and he selected some five authorities and each one of them he noted down on a piece of paper which he put into his pocket. Then I said, “Nani, would you like the books to be kept in the Chambers?” He was like, “No, no, just have them in court.” I said, “Directly in court?” “Yes, yes no problem.” Then, a week went by and the matter had not come in the court and I met him again and asked, “Nani, would you like to review them?” He again said, “Iqbal, is that a problem having them in court?” I said, “No, no problem at all!” And then I met Soli Sorabjee in court and I told him, “Look, this chap doesn’t want the books in court!” Another thing which Nani used to tell me was that ‘Just call me when our turn comes!’ and now that was a little difficult to estimate. Then, one person was arguing just before that, who was my own senior, Bhabha. Then, I went to him and said, “Counsel, will you tell me when you are finishing?” He was like “Your senior can`t come here and sit here?” So I said, “No, now don’t make it difficult for me so let me know.” Then, after some time, he asked to call him and we would call him. Nani was at Bombay House. He came charging across Flora Fountain and Bhabha was still going on and on. Nani always sat erect and upright looking at me and said, “You told me that he was finishing.” “That`s what he told me.” So he said that he`s going back. I was like, “Oh my God!” He left in between and it was a huge matter. He went off. Then, I took a decision when I thought he was finishing and I sent someone to call him immediately. Again, Nani raced across Flora Fountain and he entered the court just as Bhabha was sitting down with “May I please your Lordships...” and treated the court and all of us to one of the finest dissertations on Trust Law on first principle that I had ever heard, which was just broadly stating it. Then he said, “the first judgement I would like to cite...” then he took out that piece of paper 1848 Queen`s Bench, page so and so. He gave the facts of the case, what it had decided and then asked me for the book. He went wrong on the facts mixing up the citations and he was stuck. And the other thing, he always insisted, “Please don’t disturb me in court. Whatever you want to tell me...tell me before that." But here I had to correct this misbalance, “Nani, Not that. The other one!” “Thank you. Thank you.” So, he corrected himself in the facts of the other case that wasn’t still decided. I had never seen anyone quite like this. And we had met two weeks earlier. He remembered the facts, the propositions, the law and in between, God knows what he had done, probably gone to Argentina, gone here there everywhere come back and there he was. So that was Nani Palkhivala! Live Law: Sir, you recently completed 50 years at the Bombay Bar. If you could re-do one thing in the last 50 years, what would it be? Mr. Chagla: When you say complete 50 years, is it completion of 50 years or survival of 50 years? No, actually it`s been quite an experience! And I don’t think I have any regrets and I think that`s probably what you are asking me that do I have any regrets for that, my life would have been different had I taken a particular course and there were so many avenues open which I didn’t go for. But, I think, at the end of the day, I don’t think I have any regrets. Live Law: You have been associated with many high-profile cases, what has been the most challenging case of your career? Mr. Chagla: I don’t know whether they were high-profile or not. I think to a litigant, every case is very high-profile and very serious and important. Well, I think what was the most exciting was in Nixon`s case where Little & Co. had briefed me. And the entire Bar was arrayed against us starting with my own senior- Bhabha, K.S. Cooper and just about everybody. The stakes were very high in that matter. We were occupied in not just one court- it was in the single judge, appeal court and various others. And I kept telling my solicitors, “Why are you not briefing anybody else? What if I fall ill?” “No, you`re not allowed to fall ill!” This matter also involved even the Supreme Court for which we briefed Nani Palkhivala. But, I think that was a great challenge to have to appear against the cream of the Bombay Bar. I mean when you are yourself relatively no entity, nobody at all, you are a junior. The fact that the solicitor and the client had that confidence, I think that was a wonderful thing. But, still, I think it wasn’t high-profile, of course it was corporate litigation and I think it was the most challenging! Live Law: Recently, you represented Mr. Cyril Shroff in a matter concerning a family dispute against his brother Mr. Shardul Shroff. What is your opinion on reconciling family disputes? Mr. Chagla: The most difficult! The most difficult! There’s no worse litigation than family litigation. All other litigants have a certain sense of what is really capable of being solved in the sense of you know, of give and take. When you have family litigation, it goes beyond what is really the commercial approach to a problem. There`s too much of ego and all of that and I am talking generally of all family litigations. So it`s the most difficult to resolve and our effort always is to find some solution outside the courts and not in the court. But with family litigation, this is very very difficult. Live Law: Your father was a member of the Bombay Bar and has worked under Mohammad Ali Jinnah who, of course, was intensely embedded with the freedom struggle. Did he share any of his professional experience with him or any other eminent contemporary of his? Mr. Chagla: My father joined Jinnah`s Chambers and he was a great admirer of Jinnah, both for his politics, which was completely non-communal, until Pakistan became a reality and also as a great advocate. But, as a senior, he found him to be totally heartless. He had to go through almost seven to eight years of mere starvation, no practise at all, no income because he went to Oxford as a reasonably rich man`s son and when he came back, his father lost all the money. So, he had to really start from scratch. Just as I wanted to do Journalism, he had no intention of doing Law; he wanted to go into politics, that was his first love. But when he came back, then, out of necessity he had to join the Bar. And yeah I said he considered him heartless because one instance he told me which was of a very important conspiracy case, criminal case where the solicitor asked Jinnah, “Who would you like as a junior?” And my father was sitting there in the chamber. To which, Jinnah said, “How many juniors are there at the Bar that you have to ask me? Brief whoever you like!” When the Solicitor went out, he saw my father`s crestfallen face and he said, “Chagla, you know it`s unprofessional to recommend your own junior!” My father didn’t understand this because the solicitor went to a senior’s chamber and asked him the same question to which he said, “Yes brief one of the juniors in my Chambers.” So it was done. Then, a few days later, there was a news item, a story about Effie Smith, who later became one of the greatest Lawlords. Effie Smith was in a senior`s Chambers and the senior had gone off to Europe on a holiday and a very important case had come up so he wanted to brief his senior and the senior said, “I am not coming back.” “What do you suggest?” So the senior said, “Try Effie!” His own junior, so brief Effie Smith. And that was the making of Effie Smith that propelled him into stardom. So, my father cut out this article and put it on Jinnah`s table and after Jinnah came down from court, he ignorantly sighed and threw the paper! Live Law: What, according to you, are the challenges or lacunas that derail the judiciary in the current scenario? Mr. Chagla: I don’t think the judiciary is being derailed. But the challenges are, and they have been in the past, from the executive. That was the time when there were transfer of the judges and punitive transfers, when we all fought for the judiciary. I myself had filed a petition here in the Bombay High Court and the matter went to the Supreme Court which then, later became the ‘First Judges Case’. So, we extremely exercised for our judiciary and to protect our Judiciary and that led to the change from the executive appointing the judges to the Collegium system of judges appointing judges. We were very happy at the time that happened but, the experience has shown that the Collegium system has merely failed us. Now, this led to the recent Bill that has been introduced in the Parliament- the ‘Judicial Appointments Commission Bill’ but I think that this is even a greater disaster and this is no substitute for the reasoning that there should be transparency in the Collegium. There is even less transparency here. You have the appointment of a six-member commission, two of them being ‘eminent persons’, whatever that may mean and whose dictionary and then whose vocabulary. So, now we have these ‘two eminent persons’ who are to decide, who our judges should be in the Supreme Court and the High Court and any two members have the right to veto. So, if you have all the judges and all the others saying that yes, these are the right persons, then these two gentlemen or the Prime Minister or the Leader of the Opposition, they can derail the whole thing completely! Live Law: You belong to a family which has not only preached but, also practiced inter-religious unity and secularism. What are your views on the establishment of a Uniform Civil Code as is enshrined in Article 44 of the Indian Constitution? Mr. Chagla: I think today we are living in the most ‘intolerant’ world. There is intolerance all around us. We were meant to be under our constitution in a pluralistic society but today, what we are hearing is about all sorts of fringe elements and nobody is anything above them. They are preaching things against minorities. Recently, we had the Churches that were vandalised in Delhi and nobody in authority is saying anything at all. That`s just the intolerant part. As far as the Uniform Civil Code is concerned, I am entirely in favour of it. What it though requires is Education. I think the minorities have to be educated particularly, the Muslims and it is for the betterment of the country. If you want a pluralistic society, along with it must go the Uniform Civil Code as well so I am fully in favour of that. Live Law: Sir, you have a list of laudable achievements and there are many lawyers, students, judges who actually aspire to be the next Iqbal Chagla of the profession. What is your message to the young lawyers who are setting out in this profession? Mr. Chagla: This is going to sound a little pompous which I shouldn`t be. I would tell every young lawyer that for goodness sake, if you come into the profession please understand that it is a profession. It is not a business. It is not a trade. Unfortunately today, we find persons who practise the profession as a profession, are getting fewer and fewer. People are looking upon it as an easy way of making money. It`s not difficult to make money, you can make money but that`s not the end object of this profession. It is a very noble profession and it should be looked upon as a noble profession and ultimately, with success will also come money and all the other comforts. But that shouldn’t be the first priority. The first priority should be to have that sense of dignity, sense of achievement that you have practised the profession to the best of your ability and that I think is the message I would like to send out to all the young lawyers who are setting out in the profession.